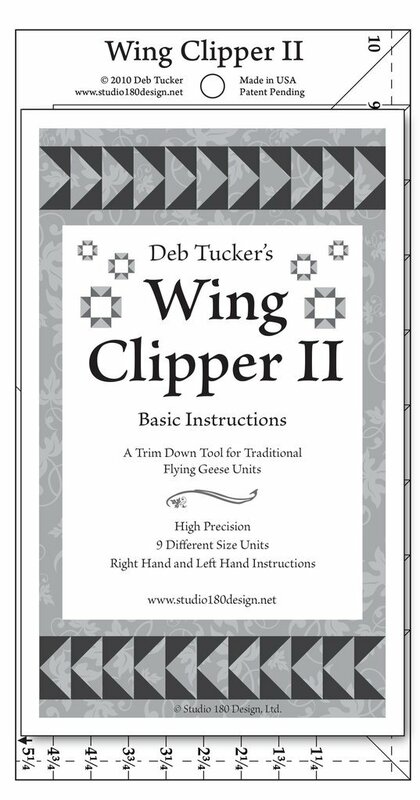 Wing Clipper 2 from Deb Tucker's Studio 180 Design is a must-have tool for making Flying Geese units and serves as an "in-between" tool for those sizes not created with use of the original Wing Clipper 1! Need to make precise Flying Geese in sizes that finish at the 1/4" and 3/4"? This tool is for you! The best part? 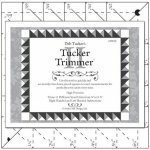 Each unit is slightly oversized and can be trimmed to the perfect size with perfect seam placement once the sewing and pressing are complete by using the Wing Clipper 2 tool. Every single unit will be accurate right and ready for piecing into your quilt. 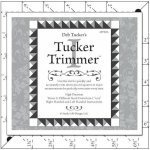 This tool includes information that will help quilters use in while making other patterns and designs, and even has instructions for left-handed quilters, too. The Wing Clipper 1 and Wing Clipper 2 together provide quilters with 19 different size options for Flying Geese blocks. Need more of this item than we show in our inventory? Use our "Contact Us" page and we'll happily assist you! Look for instructional videos using Deb Tucker's Studio 180 Design products online. Need something a little bit different? Check out our other notions from Deb Tucker's Studio 180 Design, as well as other companies!